To help with your New Year new thinking, you might like to watch this beautiful and powerful presentation! Take a look at this awesome piece of photography! It's a panoramic picture of the Earth taken from the Boeing built Space Station on a perfect night. 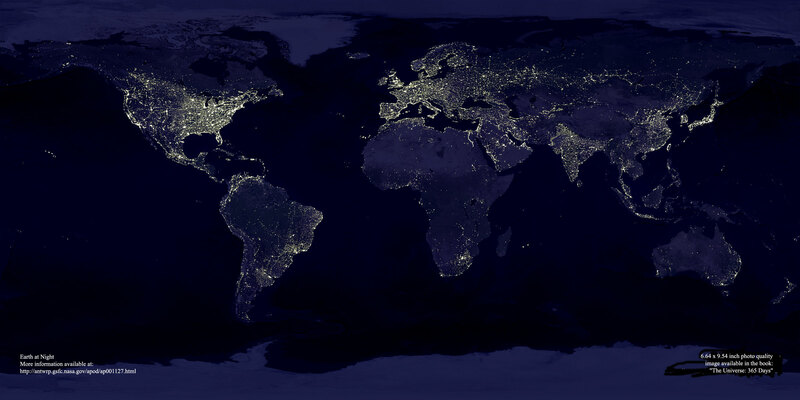 The lights clearly indicate populated areas. It is interesting to note that Canada's population is almost exclusively along the U.S. border. In Europe there is a high population concentration along the Mediterranean Coast. It's easy to spot London, Paris, Stockholm and Vienna. Look at the development of Israel compared to that of the Arab countries. Note the Nile River and the rest of Africa - after the Nile, the lights don't come on again until Johannesburg. Look at the Australian Outback and the Trans-Siberian Rail Route. Look at the density of Japan and note the difference between North and South Korea. Just sit back and look at this picture - it's beautiful! Nanotechnology - products are built atom-by-atom, assembly machines much smaller even than living cells, tiny devices that can travel along capillaries to enter and repair living cells. Many think that this will be one of the major revolutions of the new century. The "nanotechnology boom" is beginning - already private investment in nanotech outstrips government funding. A lot is being focused on molecular manufacturing, with its mind-boggling benefits for medicine, the economy, and the environment. And too, there is a lot of downside - potential for mishandling and abuse. The Foresight Institute works to spread the benefits and reduce the downsides of nanotechnology. Eric Drexler is generally recognized as the father of Nanotech, with his groundbreaking 1986 book "Engines of Creation". If you try to log on to Napster now, you'll get a message telling you that Napster file sharing has been suspended. The music industry has succeeded in shutting it down - though Napster is still trying to recover as a subscription service. Napster allowed you to download music from other computers (peer-to-peer), but it was still a central index that organized and controlled the connections. Now a Dutch/Swedish company called FastTrack has developed technology that allows truly peer-to-peer operation, with no centralized index. Based on FastTrack, three software download sites have already achieved significance: Morpheus, KaZaA and Grokster - they are now handling more than double the traffic that Napster carried during its peak in Feb. 2001. Morpheus is now the most popular software download on the Internet and the site attracts more than 1,000,000 visitors per day. Today, people download 150 million songs free over the Internet every day - which means 50 billion songs a year, the equivalent of three billion CDs of music or more than three times the 850 million copyrighted CDs sold annually. The 'Napster-effect' has quadrupled the number of songs used in a year, expanded dramatically the range of music heard, and potentially enlarged the industry. The challenge now is to make it into a viable business. "When your product is stolen by thieves, you have a police problem. When it is stolen by 150 million honest customers, you have a marketing problem." Music lawyers are trying to follow up their victory against Napster with further campaigns against the sharing of content across the Net. But, they are clearly doomed to fail. The new peer-to-peer file sharing systems are simply versions of ordinary file transfer software that the music industry cannot defeat. Unlike Napster, Morpheus isn't limited to just MP3 music - you can download video, images, documents and software and they are as easy to find as MP3 files. Frankly, when I searched for several different specific software packages by name, I was amazed at the number of sites that had them available for me to copy. As Time Magazine-On-Line comments: "It's like the proverbial genie loosed upon the Internet!" Interesting sidelight: P2P technology is also proving useful in swapping shares of stock. The pressure to provide investors with full disclosure and equal access has never been greater. The point here is to keep stock-trading quiet - P2P fulfills a desire among institutional investors for privacy. A financial analyst who follows Invensys closely reported: "What we are currently seeing is a surge of interest in cyclical stocks, especially those with high US exposure - Invensys is benefiting from this trend. Haythornthwaite appears to have gone down well with investors. His longer term challenges will be to sort out the core business and to return the overall company to a growth path." In a letter to employees, Leo Quinn (now there 10 weeks) wrote (summarized here): "Invensys is now in the midst of a strategic review process, with nine teams working on recommendations for the major vertical markets and business areas. As the review reaches its conclusion, change will no doubt be required throughout Invensys. The outcome will be communicated to all employees in February." Being an Invensys employee has been pretty grim over the last 2-3 years and I continue to hear unhappy noises. Some of this comes from crybabies, who really should have left years ago, rather than stick around to sulk. But others have legitimate beefs when their own good contributions are ignored while brown-nosing bosses bolster their own behinds by sucking up to the big guys. and getting nothing but sweet-nothings from some recently hired intermediary Marcom lackey. The $50 million Profit and Cash Challenge begun in Nov. 01 resulted in some immediate layoffs, with a clear threat for more to come unless profit goals are achieved. The new leadership is certainly demonstrating the will to win. What remains to be seen is whether they have the stamina to achieve the turnaround. Are you an "automation techie"? If you are, visit AutomationTechies.com to find lots of interesting stuff - a community website focused on the factory automation, process control, and instrumentation industry with product information, job search, industry promotions, application notes, directory of manufacturers and systems integrators, press releases, news and more. During the past two years, we've seen something like 30,000 layoffs in the automation industry - not a pretty picture. Many people were fired in spite of excellent performance at their jobs. The short-term needs (and sometimes the shortcomings) of their former employers demanded termination of their employment. Walt Boyes warns of the stark consequences for shortsighted employers. If you're an industrial automation employer (manager, executive, chief-honcho) Walt's latest article is worth reading. Industrial automation business is in a general decline - many products have become commodities. Growth and success will result for leaders who recognize the advantages that new technology brings, and for those who have the ability to provide new products and advances for old and new markets. Read my new article at automationtechies.com. "The problem is not about rich versus poor. The disparity is just a symptom of what's really wrong. Governments continue to increase their own power, while reducing liberty and freedom for all of us. Isn't it obvious by now that the cause of most of the poverty in this world is government? We do not need government wealth redistribution programs. We need less government. "The US has fed much of the third world for many years. It has done little to alleviate their situation. More resources down that rat hole will not help anyone. It is time to realize that the ONLY thing that helps people long term is more liberty. And that requires less government. "Central planning has failed everywhere it has been tried. Economic democracy, communism, socialism, fascism, or whatever name you want to give it is not the answer. History has shown time and again that government has failed massively at bringing about economic prosperity. Leave people to their own devices, protect them from external and internal violence, and they will prosper on their own, beyond belief." "The gasoline powered scooter is also available with electric-drive - costs $110 more ($459) and adds 18 pounds to the weight (42 pounds). As for lateral/longitudinal stability, man solved this problem when he learned to walk & stand upright - hence the bicycle. Did you ever think of how much fun it would be to ride a bicycle with the wheels side by side, instead of fore and aft??" "Although one does think of "big brother", it seems to be a basic thing for "virtual factories" where maintenance staffers with CAR (computer augmented reality) lenses to see the factory in two ways: Reality - and (in the lenses) the condition of machinery or the process inside the system. The thing about those systems is, that they are self-sufficient, powered by solar cells or other even more sophisticated techniques (energy for sensing process delivered by data-request). In automation technology there's a vast discussion on centralized vs. decentralized. In a recent meeting with key leaders in Germany, it was quite interesting to note how different (opposite) their convictions were. I don't really doubt that distributed intelligence will be the way field devices will develop in the future. But on the other hand, computers are getting more and more powerful, so one can't be sure how things will go. Predictions and prognostications aren't that easy somehow (smile)."